Just five minutes from the rail station, this apartment is in a building that dates to the beginning of the century. It has been recently decorated by a Parisian artist and offers all of the modern conveniences including a technologically outstanding shower, an electrical adjustable bed system, sofa bed, microwave, dishwasher, Bang & Olufson panoramic TV with build in VCR, and CD. It looks out on a little garden and is free from any street noise. As you stroll the surrounding area, you will find many restaurants, shops and craftsman nearby, and just two blocks away is a full-size swimming pool. Laundry can be picked up and delivered for about $5. Maid service is available. This is a non-smoking property. Children are negotiable. 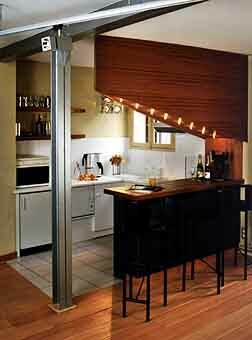 Most of all this is a very romantic studio-loft to appreciate at its best with your partner. City location. Located in a lively neighborhood out of the tourist area, yet within a five minute walk of Montmartre and Sacre Coeur. Laundry can be picked up and delivered for about $5.